Looks like people are finally realizing the enormous business opportunities lying in doing themes for Drupal sites. There is the http://www.topnotchthemes.com/ team building truly nice themes with support for common modules, knowing Drupals ins and outs. At the same time http://www.templatemonster.com/ is picking up Drupal in their CMS section, selling Drupal themes for all kinds of focus areas. Although some of their demos have the "Mambo license" menu item running, which is quite frankly not a testament to their understanding of Drupal. However, starting off from a ported theme could still be nice, those buying Drupal themes might not want to fiddle as much customizing the theme further (update: and there are possibly other problems my soft blogging style did not uncover here, see: http://www.drupal4hu.com/node/146 and http://www.drupal4hu.com/node/141 for notes). If you'd be interested in ported themes though, you might want to just start off from a theme downloaded for free. There is a new site coming up, started by a Hungarian Drupal enthusiast Ádám Boros. He is going through some of the exciting existing HTML templates and converting them to Drupal themes, providing for you to download for free. Why another theme site, you might ask? Why not just submit to Drupal.org? Well, although free to use and take, some of the HTML templates are not released under the GPL, so they are not suitable for submission on drupal.org. This requires people to either host them on their own site, or go centralize to a location. Ádám's new site, drupal6themes.com aims to not only host Ádám's work but also provide a platform for others to submit their Drupal 6 compatible themes and host them there. I am extremely happy to see all these theming businesses and the expansion of the available themes to come together, and hope the growth is going to be even bigger going forward. 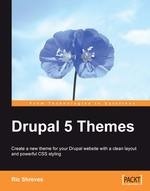 Read more about Reviewing "Drupal 5 Themes"